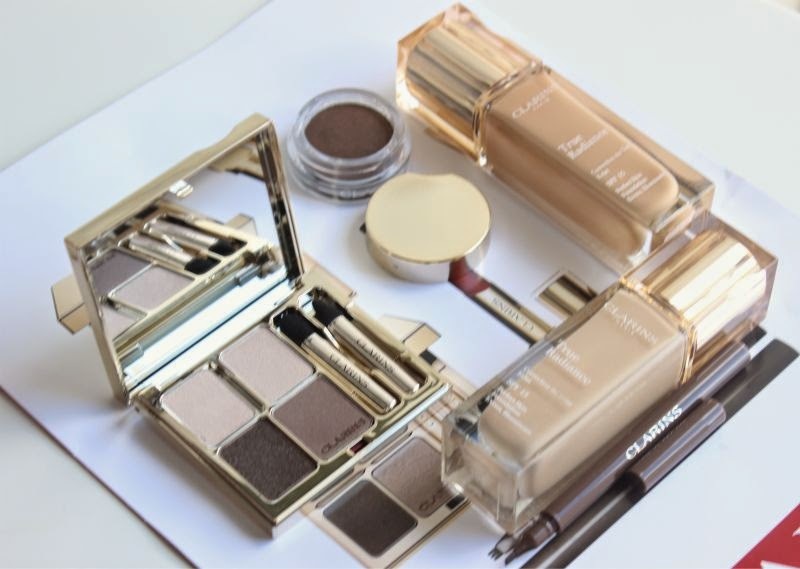 Clarins Ladylike Autumn Collection 2014 will launch this coming August and is a fairly extensive collection featuring a whole array of new neutrals. In essence the collective is very easy to wear and should suit most complexions. 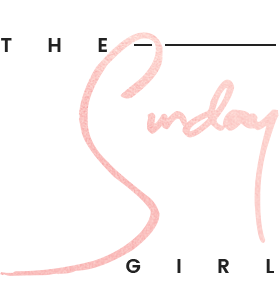 I deem it to be warm, cosy in colour scheme - a new line up of everyday staples in my opinion with new formulations, new shades of past favourites and brand spanking new products. 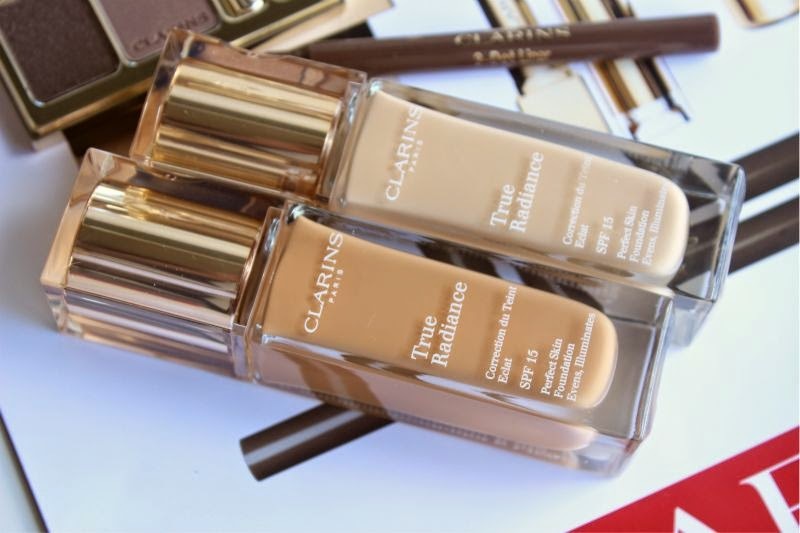 Clarins True Radiance Foundation may seem like a new product but in actual fact it has been around in the past before being discontinued a few years ago. The good news is that it is back and has been reformulated so it is better than ever. This is the first time I have experienced Clarins True Radiance Foundation so I have nothing to compare it to, what I can say is that the formula is light yet covers well, comfortable on the skin and gives a natural matte finish with a hint of radiance. Obviously a full review will follow soon as I have only just applied this to my face a few hours ago but so far so good! 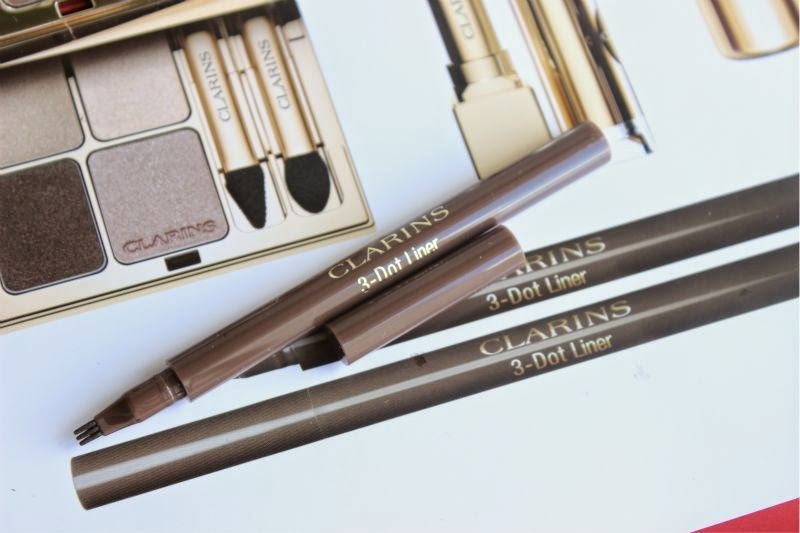 Are you a fan of the now iconic Clarins 3-Dot Liner (£20)? 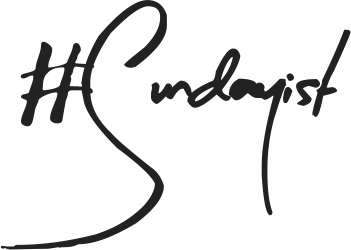 Yeah I thought so well the rather exciting news is that for the Clarins Ladylike Autumn Collection 2014 a new and limited edition shade has been created - Brown. Okay "Brown" may not sound all that exciting but I rather like that the deep, chocolate shade adds definition without looking as harsh on the skin as the black option. It is a shame this is limited edition as I can see this selling out on the spot not to mentioning becoming a firm favourite of many! 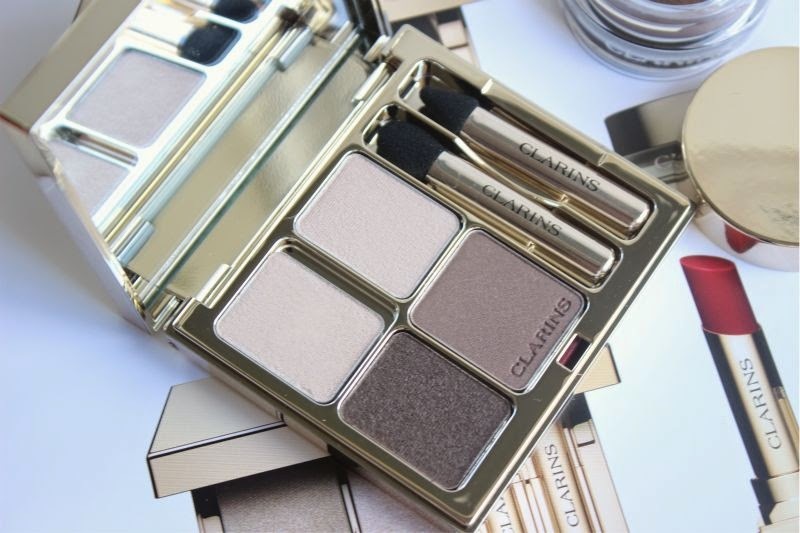 Along with the Clarins Eye Quartet in Skin Tones (£32) - four very easy to wear neutral eyeshadows in muted formulas i.e no glitter or shimmer in sight there is also a new line of Clarins Ombre Matte Cream to Powder Eyeshadows. If you buy anything from this collection let it be one of these, with six shades in total I honestly wouldn't be surprised if most end up forming a collection. 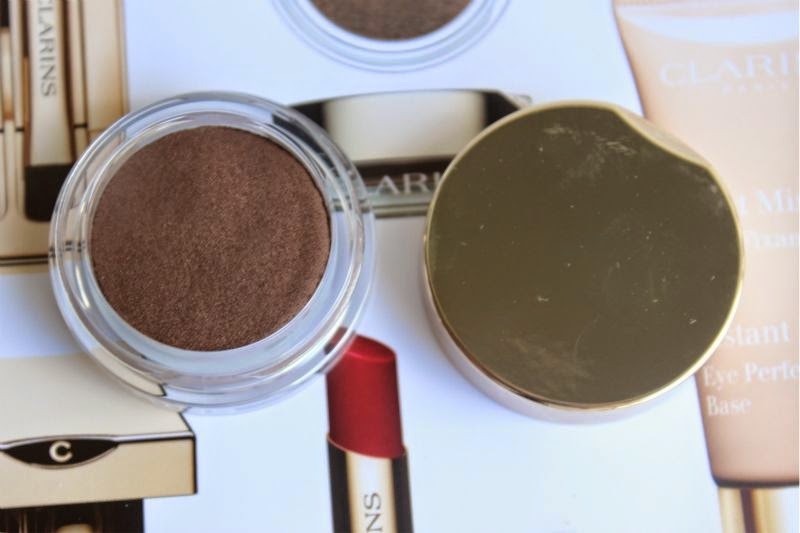 Basically this little pot of cream eyeshadow feels a lot like Chanel Illusion D'Ombre in texture - light and almost mousse like yet is completely matte. The pigmentation is wonderful and so far (it has been on my eyelids since 9am) it has not creased. This is the one product I can not wait to do a follow up review on! I have the shade earth which is a deep chocolate brown but there is more muted nudes within the collection to choose from. At £19 they are not cheap but my goodness are they wonderful. There will also be a new eyeshadow primer - Clarins Instant Light Eye Perfecting Base (£22), an eyeshadow and brow palette - Clarins Perfect Eyes and Brows Palette (£35) and five new shades of Clarins Rouge Eclat Lipsticks (£19.50) which I will personally be seeking out come launch day! Look out for reviews of the above products in the coming weeks! This new Ladylike Collection looks amazing !!! I really want them but because of my allergies, i had to check first their components to see if they ‘re safe or not for my sensitive skin !! So could you send me the ingredient list of these products please ?? It should be so nice of you ! !